It is common practice in modern-day living to install smoke detector into households, commercial, and industrial settings for the safety of the occupants. A smoke detector is a device that senses smoke, typically as an indicator of fire. The risk of dying in a home fire is cut in half in homes with working smoke detector. Some homes do not have any smoke detector, some smoke detectors do not have working batteries; sometimes the smoke detector fails to detect the fire. What are the two types of the smoke detector? Ionization smoke detector is generally more responsive to flaming fires: Ionization type smoke detector have a small amount of radioactive material between two electrically charged plates, which ionize’s the air and causes current to flow between the plates. When smoke enters the chamber, it disrupts the flow of ions, thus reducing the flow of current and activating the alarm. The photoelectric smoke detector operates using a light source, a light beam system, and a photoelectric sensor. When smoke enters the optical chamber and crosses the path of the light beam, some light is scattered by the smoke particles, directing it at the sensor and thus activating the alarm. This type of alarm responds best to slow smoldering fires. Residential fire deaths have decreased steadily as the number of homes with smoke detectors increased. People have nearly a 50% better chance of surviving a fire if their home has the recommended number of smoke detectors. Where should I Install and place the smoke detector? The detector must be screwed to your ceiling because that is where smoke heads for when something starts to burn. Smoke detector should be placed on each level of your home and in each sleeping area. As always, make sure to follow manufacturer’s installation instructions and verify all codes and compliance with your local authority. Are there places where I should not put a smoke detector? Do not install the smoke detector near the bathroom, kitchen, air supply vents, and area of the known smoke source. How many smoke detector should I have? Depend on two things, the number of levels in the home and the number of bedrooms. The standard requires a smoke detector in each bedroom, one outside the bedroom area that is close enough to be heard through closed doors, and a minimum of one on each level of the home. How often should I change my smoke detector? The smoke detector should be changed every 10 years. What is a wireless interlink function smoke detector? The smoke detector can be matched program to interlink with up to 30 units of the same model smoke detector. When a smoke detector detects smoke and gives off the main alarm, all the other match programmed detectors will give off a secondary alarm as well. The smoke detector will still function as an individual standalone unit if no matching program being made. For more than a bulk purchase of interlink smoke detector, please call 03-78314791 / Click to Whatsapp / email to [email protected] for quotation. Smoke detector is the best first line protection at home/residence area for fire protection of your beloved family. Aito product is high quality. Good. 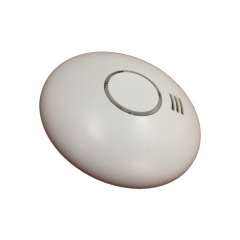 Aito Smoke Detector is the best so far. Nice quality & function! Is there any possibility to deliver this item to Sabah & Sarawak? Hi, how often do we need to change the battery? Hi, replace the batteries at least once every year. Replace the entire smoke alarm every 10 years.